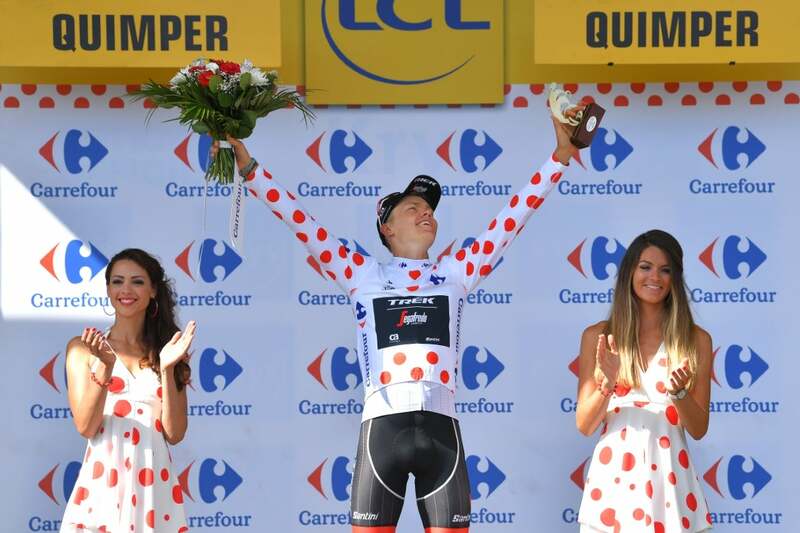 QUIMPER, France (VN) — Toms Skujins has built his career on hunting glory in breakaways, so it’s to be expected that he’d go up the road in his Tour de France debut. The 27-year-old Latvian did just that on Wednesday in the Tour’s stage 5, winning the combativity prize and the polka-dot jersey of the king of the mountains. He was pleased to get his first moment in the limelight of the Tour after the initial excitement of making the team. “Obviously the Tour is the Tour, blah blah blah,” he joked after the finish. “A lot of you guys here [journalists], a lot of fans, it makes for exciting racing. Stage 5 took the peloton 204.5 kilometers through the Brittany region from Lorient to Quimper. With a number of rollers on tap, Skujins was all-in for the break from the gun. Attentive to the early moves of the day, he made it into an initial escape that got pulled back, and then followed an attack by Sylvain Chavanel (Direct Energie). That move stuck as the day’s main break. Five other riders — including Chavanel’s teammate Lilian Calmejane — linked up with the move to make it a seven-rider breakaway. While a stage victory was the initial goal, Skujins had to recalibrate his expectations once Chavanel jumped clear from the break. From that point on, it became more about mountains points and perhaps the day’s most combative prize. A reduced breakaway group mopped Chavanel back up with some 60 kilometers left to race in the stage. Not long after, Skujins jumped away with Calmejane, and Skujins snatched KOM points on the final two climbs. He and Calmejane were reeled in with just over 10 kilometers to go. Peter Sagan (Bora-Hansgrohe) went on to win stage 5 victory ahead of Sonny Colbrelli (Bahrain-Merida). “The only thing you could do was try to get the KOM jersey, and try to get the most aggressive rider, both of which I did so I’m actually pretty happy about it,” Skujins said. As a breakaway specialist, Skujins will be busy again in the coming days. The lumpy stage 6 is, according to Skujins, probably a no-go after Wednesday’s effort — but there will be more opportunities around the corner, and Skujins is here to roll the dice. With John Degenkolb not the sprinter he was a few years ago and Bauke Mollema likely hunting a top five on GC than the top step of the podium, he may be Trek-Segafredo’s best bet for a win at the Tour de France. The exposure of spending a day or more in the king of the mountains jersey is not insignificant either — plenty of teams, especially the French Pro Continental outfits at the Tour, make the polka dots a central objective. He was particularly pleased with the reward considering how many Frenchmen there were in the break. Skujins said he’d folded the page for stage 5 in his road book shortly after getting his hands on it. The consummate opportunist should have more chances soon, with a number of up-and-down, in-betweener stages looming on the horizon.